We have repaired thousands of power steering systems since we opened up our shop here in Hendersonville, Tennessee. I believe there is no place in Hendersonville, Tennessee that can repair your power steering system better than Hendersonville Muffler Company. 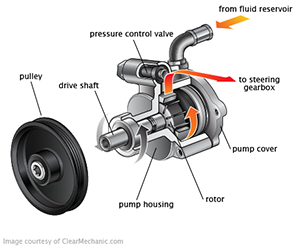 The power steering system is a fairly simple system if you understand it. We have seen a lot of bad work on power systems over the years we have been here. We have to remind the clients who brought us those cars and trucks that this system is used to STEER THE CAR OR TRUCK. Serious attention should be paid to the power steering system. Technicians working on power steering systems in our shop are always conscious of the fact that any mistakes in the power steering system could make it hard or impossible to steer the vehicle. Hydraulic systems in general were first used in the late 1800's. It didn't take long before someone though it would be a good idea to use hydraulics to help steer a truck or car easier. The first systems that were used on cars and trucks proved to be more trouble than they were worth. Rubber and seal technology was fairly poor in the early days. The cars and trucks of the world were still called "Horseless Carriages" and they were generally driven by men. The power steering systems that you see on modern cars were mostly designed in the 1930's on trucks and first used in production cars in the 1950's. The systems have been refined since then and the materials and production methods have gotten better. Still power steering is basically the same now as it has been for about the last 60 years. Some of the newer cars use electric power steering and many of the new cars use sensors to inform the PCM, (That's the engine management computer system) about power steering pressure but the systems are still basically the same systems from the 1950's. Power steering systems are not a mystery to the technicians at Hendersonville Muffler Company. Early power steering systems had the steering wheel turning about 6 turns from lock to lock if the power steering went out it would be physically possible to turn the vehicle if the power steering went out. In contrast to the past, the cars and trucks today rely heavily on the power steering system and most cars and trucks turn from full left to full right in just three turns. If you lose your power steering it is VERY difficult to steer the vehicle. Fortunately the systems used today are made of much better materials. The fittings and lines are far superior to the cars of the past. As the systems have become more reliable the manufacturers have relied on them more. If the power steering goes out on a modern vehicle the vehicle will be impossible or at least very difficult to steer. In early times the cars were all rear wheel drive. Now mostly all of the cars are front wheel drive which is much harder to steer. Hendersonville Muffler Company repairs cars and trucks in Hendersonville, Tennessee. Since almost all modern cars and trucks have power steering systems we have done a lot of power steering repairs here in Hendersonville , Tennessee. Don't take chances with you or your family's safety. Have the trained technicians at Hendersonville Muffler Company repair your car or truck when power steering repairs become necessary for your vehicle.